"Hearty soup when vegetables are plentiful and fresh." Heat oil in medium size saucepan. Add potatoes, celery, and onion, saute for 5 minutes. Stir in cabbage, cover and cook over medium heat, until cabbage is tender. Add broth, bay leaf, pepper and pork and beans. Heat until soup is hot and then remove bay leaf and serve. This soup combines potatoes with bacon, cheese, and the works. What a great soup for a winter meal. I cut up some leftover ham and added that to the pot too. I also had to add salt. This soup is definitely a keeper. Super easy to make, I threw it all in the pot together and let it simmer away. I love how it is low-cal and high-fiber too. Different and tasty. Quick, Easy, Cheap and Tasty. What more could one ask for? 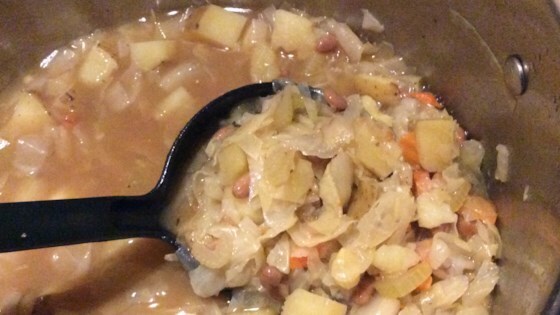 I love cabbage in soup, so I enjoyed this recipe and found it very good.